Dice the red beetroot and avocados; add lemon on the avocado to prevent it from turning black. 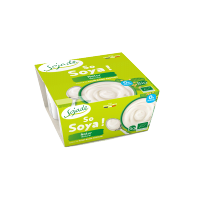 In a bowl, combine the Sojade nature tubs, chives, parsley, shallots, oil and vinegar. Add salt and pepper to taste. 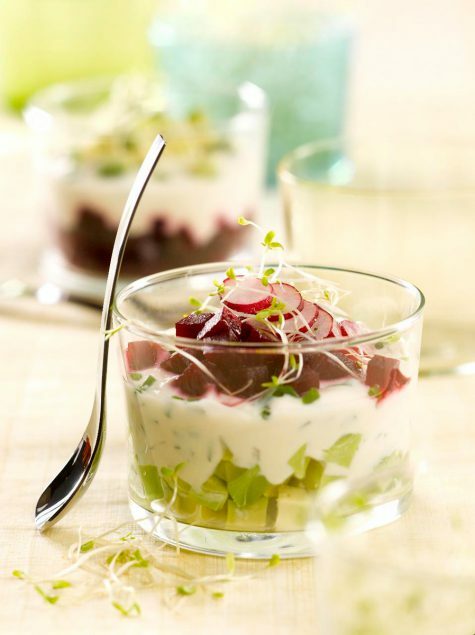 Take 4 nice glasses and set the avocado cubes at the bottom of the glasses, then add a layer of yogurt wih herbs. Cover with the beetroot cubes and finish off with the yogurt. Decorate with a radish and a few young alfalfa sprouts. Set aside for 15 minutes in the refrigerator before serving.